NCBI maintains a wonderful FTP server full of bacterial/archaeal genomes, but I just want the genome from a good old E.coli strain. There are over 50 to choose from, so I picked one more or less at random: a strain of E.coli 0157H7. From the 0157H7 link , download the file called BA000007.fna, where fna means Fasta Nucleic Acid (in other words, it’s the genome as DNA in FASTA format). I used the same code as for the synthetic data above (code is at the end of this post) and found that the real genomic DNA has a distribution that is remarkably similar to the random synthetic genome (Fig. 2), though it does depart in an important way. See how the blue (real) curve drops faster at first but then changes its final slope to decrease more slowly? This suggests that the distribution of sizes is weighted towards the right. In other words, there is an overall increase in the size of mGenes. Fig. 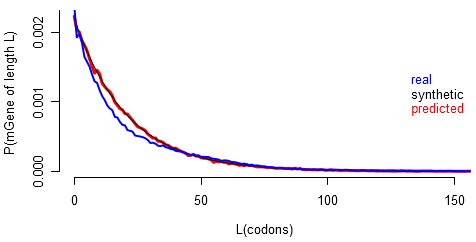 2: Probability of mGene lengths. The black “synthetic” line falls on top of the red “predicted” line. Fig. 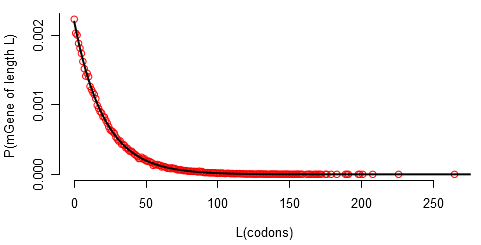 3: Cumulative distribution function of codon lengths. The black “synthetic” curve lies on top of the red “predicted” curve. To calculate these probabilities, I used every reading frame (there are six). So let’s say that there was a long mGene in frame 1 that corresponded to a real gene. In all 5 remaining frames, it is likely that that same length of DNA will be composed of multiple smaller mGenes. This is because a gene is only coded in one reading frame, and so in all other frames the sequence is essentially random. In effect, the increase in long mGenes is diluted by considering that same mGene in all other frames! How do we get around this to answer the original question: What is the average length of a prokaryotic gene? 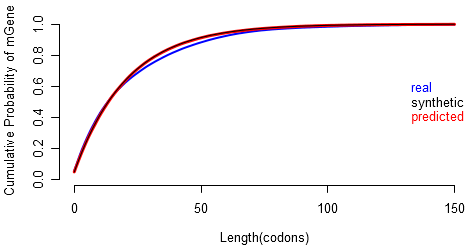 To get rid of the dilution problem we can make synthetic genomes of the same length as the real genome, and then simply compare the number of mGenes in each that are larger than 100 codons. I will leave this for a future post. """Write a random string of AGCT of size 'length' to a file 'savename'.""" """ Given a fasta file name, write a file containing all mGenes.""" How did you get “6” reading frames? Codons are triplets of nucleotides, not sextuplets. My understanding is that there are a total of 3 reading frames for each section of DNA. Am I wrong? You’re thinking about it exactly right, but forgot the easy-to-miss point that the reading frame can either be in the 5′->3′ or the 3′->5′ direction. As you said, there are 3 reading frames, but there are 3 in both directions.